What could possibly be better than to be a starting centerfielder for a major league team? 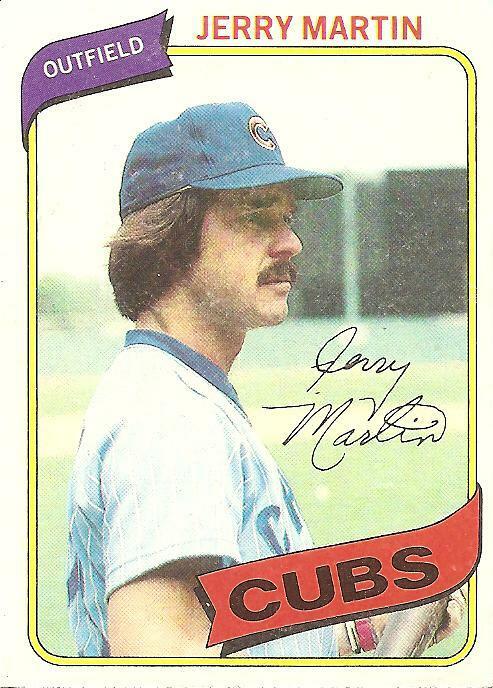 And yet, Jerry Martin, who held just such a position for the Chicago Cubs at the time of this 1980 card, wears an expression that makes it seem like he’s counting the hours left in his shift at the circus, where he’s employed to brush the teeth of tigers and give elephants enemas. According to the back of this card, life was getting better and better for Jerry Martin. The son of a major leaguer, Barney Martin (who pitched briefly for the Reds in the 1950s), Jerry had broken in with the Phillies in 1974, playing just 13 games, and then had gotten more and more chances at bat with each succeeding year as the Phillies developed into a National League powerhouse. The card suggests that he played an important supporting role for the Phillies as they won three division titles in a row from 1976 through 1978. In the first of those seasons he appeared in 130 games despite logging just 121 at-bats, evidence of his usefulness as a late-inning defensive replacement for lead-footed fly-ball mangler Greg Luzinski. In 1977 he got nearly a hundred more at-bats, occasionally platooning with Bake McBride, and hit a respectable .260 with some power, and in 1978 he got even more playing time and responded with new career highs in homers and batting average while, as the bullet points at the bottom of the back of the card relate, also hitting three pinch-hit home runs during the regular season and a fourth in the playoffs. Finally, in 1979, he got his chance to be an everyday player upon being traded to the Chicago Cubs, and he upped his career singe-season high in batting average to .272 while smacking 19 home runs and 34 doubles. But on the front of the card, he seems to be considering his life and saying, I want out. vemmerf: I grew up 30 minutes from Shea. [Martin] rented a house in my neighborhood for the summer . . . and my buddy and I looked in the yearbook and found the name of some assistant to the PR director and called Martin, saying we were that guy. We told him we were shooting a commercial for Banner Day and we wanted him to be a part. He fell hook line and sinker. Feel kinda bad about it, but it was better than egging his house. Shari: I remember this poor shnook getting the call to pinch hit in the bottom of the ninth . . . he struck out, and he got booed the whole way back to the dugout. That was the last time I think I ever saw him as a Met. He was trying to make a comeback after being in re-hab. I was at the game, and I just remember feeling really sorry for him, as he hung his head in shame and took the slow stroll back to the dugout. Couple of book-related things: Josh Spilker (not a lazily conceived pseudonym, I swear) has a feature at Impose Magazine on my recent reading list. Elsewhere, Tom Hoffarth of the L.A. Daily News reviews Cardboard Gods (and Dave Jamieson’s book Mint Condition). You are currently browsing the archives for the Jerry Martin category.